Suppose puddnhead is in the pay of the Republicans? 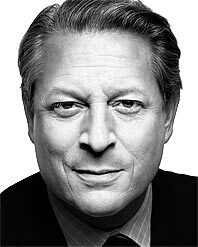 I'm taking a vow starting tonight not to read another repulsican word written about Al Gore. These columists are but small lapping waters against a sandbar........they won't be able to stop the tidal wave movement called DraftGore'08! Podhoretz? His column is already lining the birdcage! Who cares what he says? The writer forgets that Dean was taken down by the Democratic Leadership Council, of which rightwing organization Clinton is an enthusiastic member. Clinton, Kerry, Biden, Obama, and the rest of that lot--- corporatists, militarists, imperialists to the bone---do not, will not represent the great mass of Americans who work for a living and are on the losing side of capitalism. For them (us), Russ Feingold is head and shoulders above any DLCer, but should we sacrifice him to rigged elections? What a waste that would be. The inventor of the internet seems to believe Howard Beale was a real person, and he is the reincarnation. When Al Gore, Jr. watches the movie "Network", does he weep openly or simply wet himself?